Bokeh is a new kind of book about cameras designed for the iPad that contains lessons on focus, depth of field, exposure, and zoom. Each lesson simulates the photographic process on a real scene as you interactively adjust a camera setting. 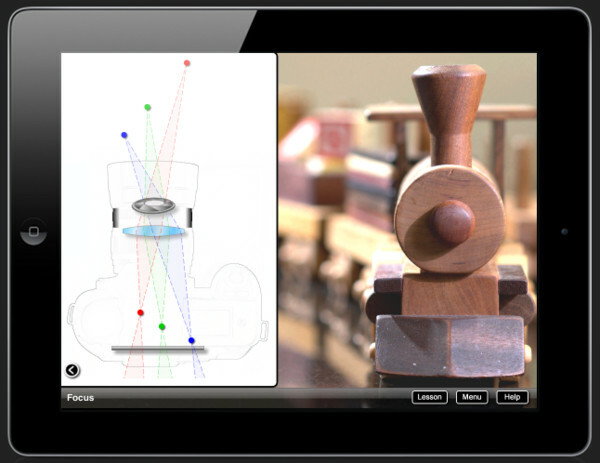 For example, in the focus lesson, as you change the focus ring, the diagram on the left illustrates what happens inside the camera while the photograph of a wooden train changes before your eyes. Each lesson also contains a lengthy technical description. This book will appeal to enthusiasts who want to learn more of the science behind photography and how modern digital SLR cameras function. everythingicafe.com: "...It’s a $1.99 app, and does an excellent job of diagramming what can otherwise be pretty hard to explain concepts..."
DeanatNCSU (iTunes store review): "If you are one of those people for whom taking pictures is simply standing back with a point-and-shoot or *gasp* just using your phone camera, this simple, straight-forward app helps to demystify some of the terminology that "real photographers" throw around. I honestly had no clue what an f stop was, but I feel like this nice interactive introduction provided a good way for me to grasp this term along with how it affects the pictures you take. The lessons provided are short, but have a nice interactive quality to them that adds a great deal. I would love to see more lessons in future updates along with a single interactive lesson where you can adjust everything (f stop, shutter speed, zoom, etc) on a single image so you can really figure out how people dial in on good pictures. Nice work!" Wilbur Amos (iTunes store review): "As I told you on DPReview, I used your program last night with my beginner photography course that I'm instructing. The response was EXTREMELY positive; all four people in the class that own iPads downloaded it before the night was out. I used the program with a projector, and watched as the bulk of the class experienced an "ahah!" moment. It is an extraordinary tool for teaching new photographers...they ( and I ) would love to see additional lessons on white balance, more info on DOF, and exposure compensation.